I've noticed that my day number designations are one day off from the itinerary that they gave us for our trip, but I guess that doesn't really matter. Our itinerary booklet shows our day of flying to Beijing as Day One and Day Two starts at 11:30 PM(huh? )in Beijing with our arrival at the airport and the short night in the hotel. That felt to me like one very long day of travel ending with a night in the hotel. The day was 13 hours longer than usual and we crossed the international dateline. But whatever. To me a day is not complete until it ends with a few hours of sleep in a bed. I do not mind long hours of travel at all. The time on the plane actually went by fairly quickly. I love going new places and the long hours of travel are part of that process. As long as I get some sleep each night in a bed, I am happy. 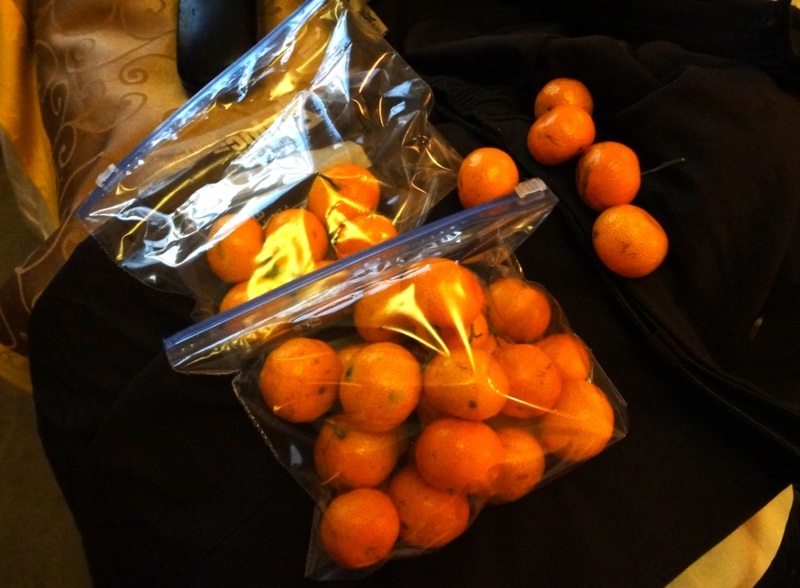 At one of the venues they had Mandarin oranges and Doug got all hoardy with the ones that weren't eaten by the end of the concert. He started out with three ziplock bags full of them. He ate tons of those oranges on this trip and actually replenished his supply a few times. I was also maintaining a stash but my thing was to stock up on was the bottled water they provided at the venues. The tap water in China is not safe to drink. You can't brush your teeth with it or have drinks with ice in them. I definitely will not miss having to rinse my toothbrush with bottled water and having to keep my mouth clamped shut while taking a shower. I remember very little about our time in Jinzhou, except that we travelled there by bus, not on a train or airplane, and the name of our downtown hotel was Elite International Business Hotel and the venue was the Riverside of Rhine Concert Hall. 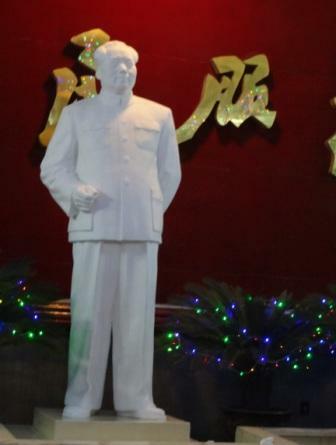 I'm not sure why it had such a non-Chinese sounding name. 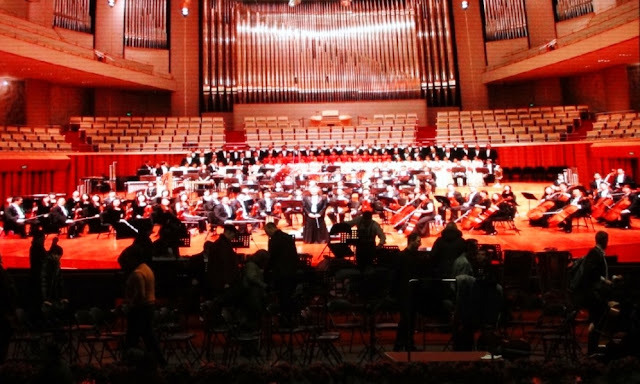 The stage in Jinzhou had a fancy backdrop that was a photo of a Chinese orchestra and chorus playing on the same stage. We played in front of this backdrop - you can see people setting up in the foreground. We performed at several of the top concert halls in China and they were always quite lavish, with some occasionally bordering on gaudy. There were often balcony seats behind and all around the stage which was fun because it felt like we were closer to the audience. Most of the audiences were very enthusiastic. Some were more reserved, but all were very polite.